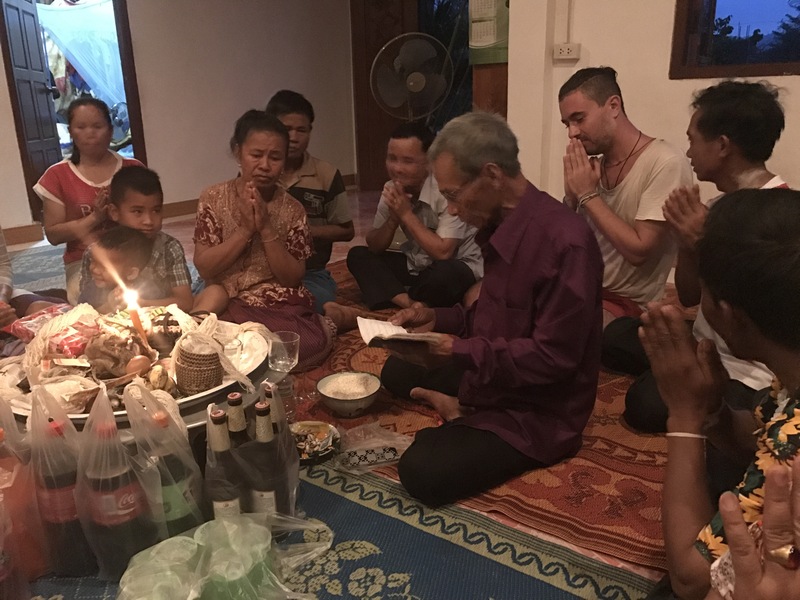 First night in Laos,we went to a family for new year ritual, they invited a shaman to their house. All the family members, neighbors and friends to sit around in the middle of the living room with a big round plate full with food. 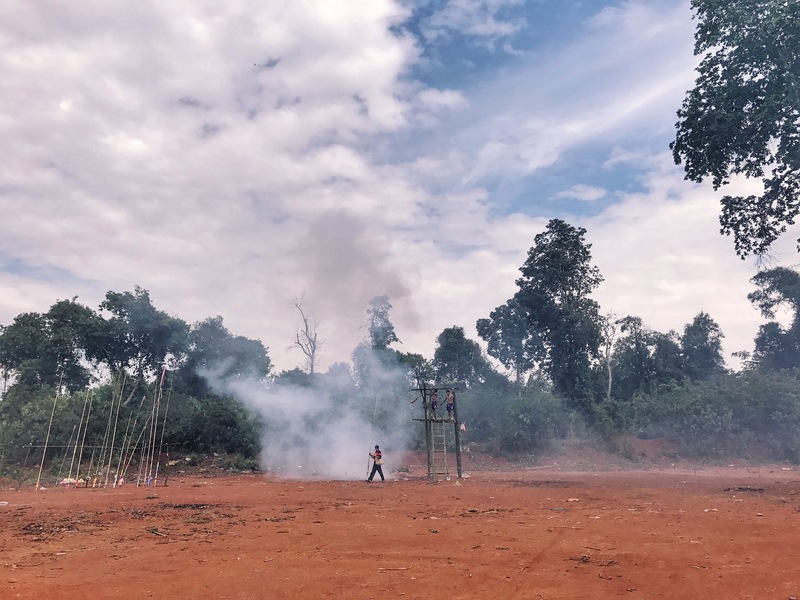 Shaman asked us to put one hand on the plate, he started chanting, then he hanged an egg with thin rope and asked the householder to take the rope, then the egg fell. Shaman took out an old note book, he asked everyone to put their palms together, and then he started to chant again. He’s an old man, even though I didn’t know what’s the incantation he was chanting, but I felt it was full of energy with his age, anyway, I was listening with all sincerity. Later, shaman took the ropes from the plate, he tied knots on the wrists of everyone, and in the meantime, he blessed people. This was my favorite part of this ritual, we tied knots on everybody’s wrists and blessed each other. Except for my birthday, this was the night I got the most much blessings ever. I would like to use a word to describe Laos new year – “noisy". Don’t know why the audio equipment was so well sold in Laos, but I could hear the loud Laos style pop music on every street. Most of families had a long table with food, beer Lao or whisky Lao. It was like the whole town was having a party. We went to few houses, all friends of Somhuk. The noisy party came to its culmination with the “local homemade rocket show". I think they were just flying bombs. It was held at an empty ground near Vieng Phouka. There were men equipped with guns, the local guards, others were dancing and drinking. 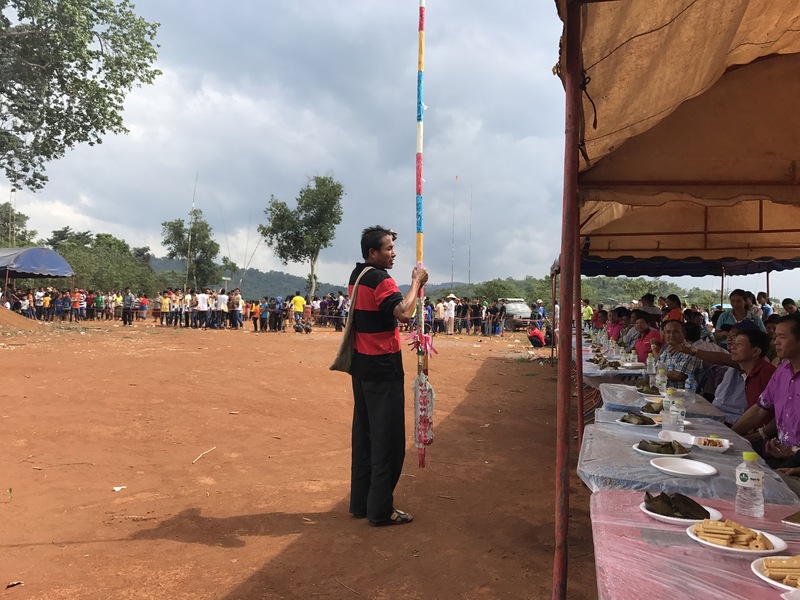 People brought their own rockets on a long bamboo stick. they signed in and handed over their rockets to two young guys who were responsible to lit the rockets. The one that flew the highest was a success and people cheered. Some of them exploded on the ground before taking off. I couldn’t understand what was so great about that show, to that time I just wanted to go back to the peaceful Nam Mang village.